He is al-Imam al-Habib `Umar bin Ahmad bin Abu Bakr bin `Abdullah bin `Abd al-Rahman bin Muhammad bin Zayn bin `Alawi bin `Abd al-Rahman bin `Abdullah bin Muhammad Sumayt bin `Ali bin `Abd al-Rahman bin Ahmad bin `Alawi bin Ahmad bin `Abd al-Rahman bin `Alawi `Amm al-Faqih (uncle of al-Faqih al-Muqaddam), bin Muhammad Sahib Mirbat, bin `Ali Khali` Qasam, bin `Alawi, bin Muhammad Sahib al-Sawma`ah, bin `Alawi, bin `Ubaydullah, bin al-Imam al-Muhajir il-Allah Ahmad, bin `Isa, bin Muhammad al-Naqib, bin `Ali al-`Uraydi, bin Ja`far al-Sadiq, bin Muhammad al-Baqir, bin `Ali Zayn al-`Abidin, bin Husayn al-Sibt, bin `Ali bin Abi Talib and Fatimah al-Zahra’, the daughter of our Master Muhammad, the Seal of the Prophets ﷺ.
Habib `Umar was a descendant of Habib Muhammad bin Zayn bin Sumayt, a great scholar and one of the main students of Imam al-Haddad and Habib Ahmad bin Zayn al-Habashi. 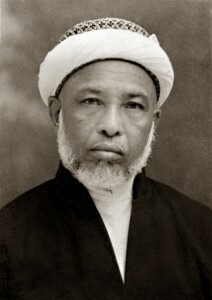 His grandfather, Habib Abu Bakr, left his birthplace in Shibam in Hadramawt and settled in in the Comoros Islands, off the coast of East Africa, and this was where Habib `Umar was born in the year 1303 (1886). His father, the great scholar Habib Ahmad, was with his shaykh, Habib Fadl bin `Alawi Mawla al-Dawilah, in Istanbul at the time of the birth. Habib Fadl gave Habib Ahmad good tidings of the birth of his son and named him `Umar long before any news of the birth reached Istanbul. In fact, the baby was given another name which Habib Ahmad changed to `Umar when he returned from his travels. 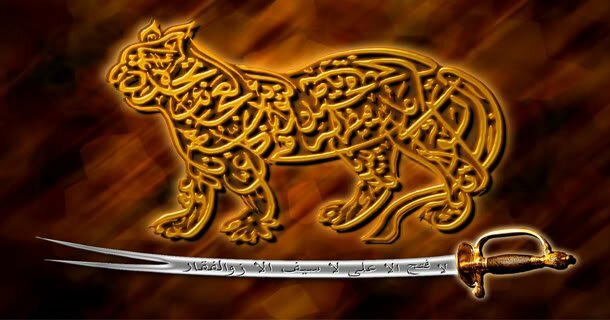 Due to the absence of his father, it was his mother, the pious Fatimah bint al-Mu`allim Shanzi, who raised him in his early years. When he was six, his father requested that he be sent to him in Zanzibar, where he was a judge. There he oversaw his development until, at the age of eight, he sent him to his ancestral home in Shibam. In Shibam his father’s uncle, Habib Tahir bin `Abdullah bin Sumayt, took over the supervision of his education. During the years he spent studying in Hadramawt, he received knowledge from the masters of the time, among them Habib `Aydarus bin `Umar al-Habashi; Habib Ahmad bin Hasan al-`Attas; Habib `Abd al-Rahman bin Muhammad al-Mashhur and his son, Habib `Ali; Habib `Ali bin Muhammad al-Habashi; Habib `Alawi bin `Abdullah bin Shihab; Habib `Abdullah bin `Umar al-Shatiri and Habib Salim bin Hafīz. His father then ordered him to return to Zanzibar. Habib `Umar kept his father’s company constantly and continued his studies at his hands and the hands of the scholars of the island until he emerged as a great teacher and caller to Allah. He saw that the Comoros Islands were more in need of his knowledge than Zanzibar, and thus he returned to his birthplace. 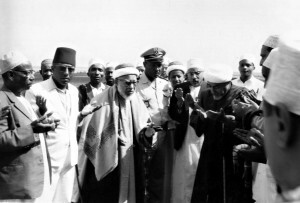 His intense concern for spreading knowledge and Prophetic guidance caused him to travel constantly throughout the towns and villages of the islands and also to make excursions to the neighbouring island of Madagascar. He said: “If you want rest in the next life then forsake rest in this life.” As a result of his efforts many people accepted Islam. He was involved in building a number of mosques and schools, and built tanks to collect rainwater to provide drinking water to those that needed it. In a certain area many people were suffering from malaria but when they drank the water from one of Habib `Umar’s tanks, they were all cured. After his father’s death in 1343 (1924), he returned to Zanzibar to divide his inheritance. Three years later, he returned again to the Comoros, where he continued teaching and calling to Allah while engaging in some business to support himself. 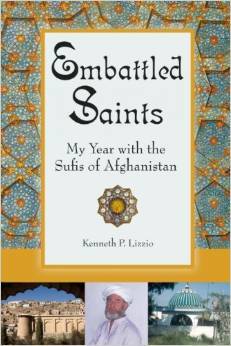 While being a master of the Ba `Alawi Way, he was closely connected to the Shadhili and Qadiri orders on the islands. He would attend their gatherings and even composed poems which are still sung in those gatherings. In 1355 (1936), the Sultan of Zanzibar appointed him judge of the island of Pemba and then in 1357 (1938) as one of the judges of Zanzibar, as his father had been before him. In 1362 (1942), he was appointed Chief Judge of the island. He performed his role in the best possible way for around twenty years, constantly mediating between conflicting parties while hardly ever having to issue a judgement. He reorganised the system of religious endowments (awqaf) such that their proceeds were spent correctly. As a result old mosques were refurbished, new ones built and a salaried imam was appointed to each mosque. He held a daily gathering after `Asr in the Jami` Mosque of Zanzibar. He would teach from Fath al-Mu`in, an advanced text in the Shafi`i school. A large number of people would attend, amongst them people of wealth and status. When he saw that the majority of people did not understand the lesson, he told some young boys to read to him Safinat al-Najah, a basic text, so that everyone would learn the rulings of purification and prayer. During these years, he would make annual trips to Hadramawt and the Hijaz. He also visited Egypt and travelled throughout East Africa. He always had the best opinion of Allah and instilled this in whoever was with him. People would come to him with their problems and leave full of hope in the mercy and grace of Allah. He said: “Seeking to approach Allah (iqbal) is the door to acceptance (qabul). Even if He only accepts one, everyone else will enter because if people come to the door of the Generous, He will not allow some to enter and turn some away. He will allow them all to enter.” He counselled people every morning to intend the good actions that they wished to perform that day so that they would be guaranteed the reward even if they were unable to perform them. One would expect a scholar and caller to Allah of his stature to be a great speaker, but Habib `Umar spoke very little. His call to Allah was with his state (hal) rather than his words. The Messenger of Allah ﷺ said: “If you see someone who has been given silence and abstinence, draw close to him, for he receives wisdom.”1He indicated that just as the turtle uses its gaze to raise its young, he would impart spiritual secrets through his gaze. He kept his gatherings short but his presence had such a strong effect on those in attendance that they would find their souls being raised and their worries removed. They would leave with the desire to do good. He possessed immense humility and would personally serve his guests. He had a great gift for poetry, but he never allowed any of his poems to be published. He was constantly in a state of vigilance of his Lord. Whether alone or in company, he would sit very straight with his head lowered, deep in reflection. Many great scholars graduated at his hands, such as Habib `Umar bin `Abdullah bin Shaykh Abu Bakr bin Salim, who travelled the world calling people to Allah. Many others benefited from him, among them Habib Ahmad Mashhur al-Haddad, Habib `Abd al-Qadir bin Ahmad al-Saqqaf and Habib `Abd al-Qadir bin `Abd al-Rahman al-Junayd, who wrote a short biography of him. When he wrote to his close students, he would address them as his spiritual children. Although he had no male offspring, he had many spiritual sons. The revolution in Zanzibar caused much turbulence and oppression and caused Habib `Umar to leave the island with his whole family. He settled for a time in the city of al-Shihr on the South Yemen coast until the president of the Comoros Islands insisted that he return to his birthplace. Habib `Umar’s insight also told him that troubled times were ahead for South Yemen, so he moved with his family to the Comoros. There he lived out his days, continually calling to Allah until his death on 9th Safar 1396 (1976) at the age of 92. He was buried in the qubbah (dome) of his grandfather, Habib Abu Bakr, in Moroni, Comoros. May Allah have mercy upon him, benefit us by him and grant us a portion of his legacy. Such is the place that Habib Umar holds in the hearts and minds of the people of the Comoros Islands that his picture features on one of the nation’s banknotes.